Deanna is a Master Practitioner Trainer an Expert, Specialist in her field practicing since 1998. Working extensively with an elite client base of athletes, TV & Business CEO’s, musicians, movement and creative artists and professionals in general. 20 000 hands-on hours in private massage practice & 30 000 hours Teaching, Training and mentoring via her accredited school. Masterful intuitive sensing and dynamic vast skill set. 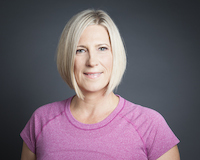 Deanna Trained extensively in Thailand, the United States and in Canada with Master Teachers with diverse styles and methodologies and built her unique style from decades of hands-on practice. Ajna began working at the clinic at Thai Massage Toronto in 2009. She received all her Thai Massage training and certifications with Deanna Villa through a lineage that originates with Master Picket Boonthume. Choosing to identify the source of pain and tension over symptomatic relief has set her on a trajectory of self-determined continuing education. She is currently studying Immaculate Dissection®, NeuroKinetic Therapy®, Advanced Anatomy, Integrated Muscle Testing and Palpation®, The Science of Awakening® and hosts workshops on personal transformation and meditation. Previously Ajna studied ballet and contemporary dance for 15 years, and spent the following 10 years choreographing and performing professionally in Toronto and abroad.